Another weekend, another walk in the woods. My recent outdoor adventures may suggest that I have a one-track mind, but it’s not completely my fault: this hiking thing is truly addictive. That’s something I never thought I’d say, given all the family vacations during which my little brother and I grumbled through our forced marches through the wilderness. But now that my rear end is firmly planted in a swivel chair for forty hours a week, I all but catapult myself out of the suburbs once Friday rolls around. And there’s no better way to sever yourself from the daily grind than to clamber up a mountain, frolic your way down, fill your lungs with crisp air and watch fog tumble into the Shenandoah Valley. Here’s one beautiful thing about traveling to a place like the Shenandoah Valley: its magical quality isn’t confined by its borders. You find bits of that magic as you move toward your destination. You find it in the towns you pass, in the rickety wooden bridge leading you over a burbling brook to the shop selling handblown glass. And you find it alongside the road, in the wooden farmstands lined up with their toes against the asphalt. 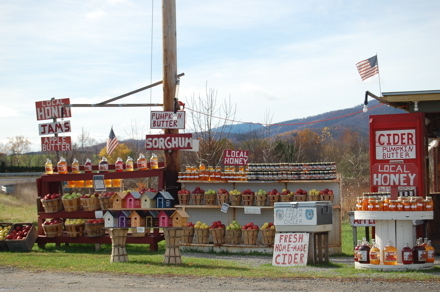 The ones that offered fresh peaches were charmingly shuttered, part of the landscape even through the off-season. 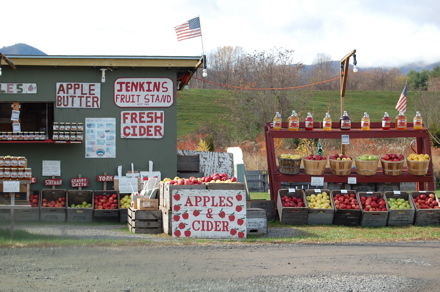 More imminently attractive to passersby were the stands displaying overflowing baskets of apples, jars of Virginia honey—and coolers stuffed with cider. On the way to the park, we bought a half gallon and drank straight from the plastic jug. Now, I’ll be honest (now that I’ve buried my confession in text and images): for an embarrassingly long time, I thought that there was a mountain range called “the Shenandoahs.” Apparently, however, there is only one Shenandoah, and it’s a valley. Clearly, the only way to atone for my baffling ignorance was to visit. 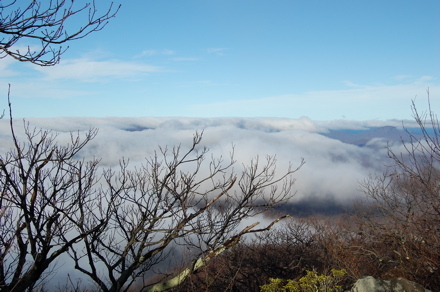 It took only one look down from the trail to find visual evidence of Shenandoah’s true identity: it’s a massive, beautiful basin into which the aforementioned pillows of fog tumble on stormy days. Cavorting through Shenandoah National Park, then, did much to restore my outdoor-knowledge street cred. 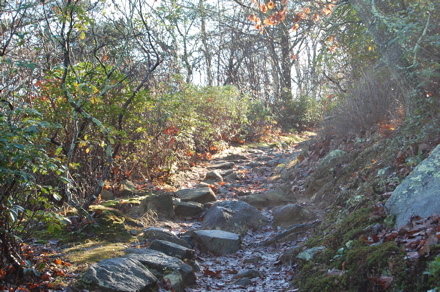 More importantly, though, I crossed an item off my life list by hiking a stretch of the Appalachian Trail. 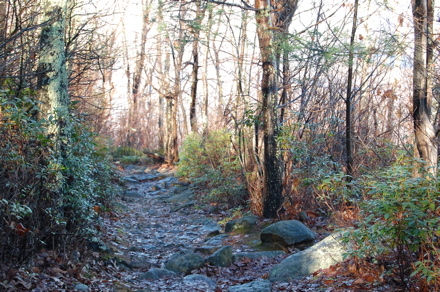 It was a six-mile trek, which is a far cry from making the point-to-point journey from Georgia to Maine. But just setting foot on the legendary Trail was a solid start, and you can be sure I won’t stop there (I told you it was addictive, didn’t I?). It’s always satisfying to cross something off a list. But even more satisfying was feeling muscles in my legs that I didn’t know existed. So was being ready for bed at eight that night—not because of sleep deprivation, but because I had pushed myself physically. Somehow, nodding off into my post-hike bowl of tomato soup made me feel worthwhile in a way that forty hours on the clock never could.